Coordinate Measuring Machine rooms, or CMM rooms, rooms require a very controlled environment in order to properly record all the 3-dimensional point on an object's surface. In our modular CMM rooms, we provide everything that you will need to have a clean and contained setting. We provide soundproofing to deaden the noise coming from outside your CMM room, thermal insulation to control the heating and cooling of the room, and fireproofing to help you protect your investment. We also offer a number of HVAC option to allow you to control the airflow in your CMM room to your own custom level. We can install a CMM room in your warehouse or facility with minimal disturbance to you and your work environment, and we provide freight to all areas of the continental United States. 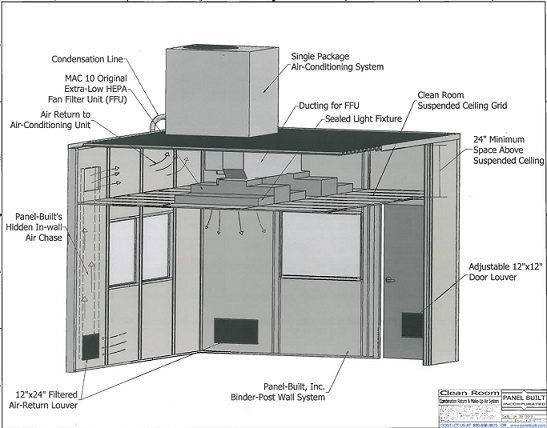 Plus, our modular CMM rooms can be deconstructed and moved to another facility if needed. Plus, you do not have to worry about wear and tear on the building, due to the strong nature of our paneling system. Our panelized wall systems provide flexibility in design for your CMM room. Even if a facility has heavy machinery or equipment already in place, panelized coordinate measuring machine rooms can be built around the machinery without any issues.